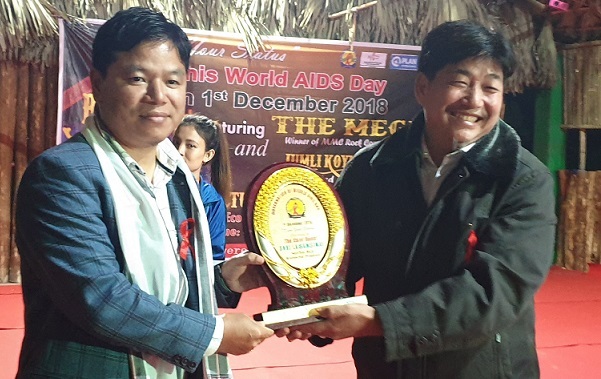 To mark World AIDS Day, the Arunachal Pradesh State AIDS Control Society (APSACS) in association with Being Arunachal, an NGO on Saturday organized an awareness programme on AIDS through a musical concert at the Eco Camp in Doimukh near Itanagar. The aim of the event was to sensitize people from all walks of life on HIV/AIDS and motivate them to come forward and get tested to know about their HIV status while ensuring that all HIV positive cases are put on treatment. Nampong MLA Laisam Simai who attended the said function as chief guest called upon the people to equip themselves with the knowledge of HIV so that the disease can be prevented. He further appealed all to voluntarily get themselves tested for the virus so as to know one’s status. While appreciating the role of APSACS in creating awareness about HIV/AIDS in the State, Simai asked everyone to extend their support to the society in order to eliminate the deadly disease from the State. Family Welfare joint director Dr S Bhattacharjee who attended the programme as guest of honour stressed on the ABC strategy which is credited for bringing the HIV/AIDS epidemic under control. “A stands for Abstinence, B stands for Be faithful to your partner and C for condom usage,” he said. Dr Bhattacharjee also highlighted the services available with APSACS for HIV prevention and control. APSACS’s project director in-charge, Dr A Borang in his address highlighted the aims and objectives of World AIDS Day. While focusing on the theme of this year’s celebration i.e “Know Your Status”, Dr Borang said that HIV testing is essential for expanding treatment and ensuring that all people living with the infection can lead a healthy and productive life. “Unfortunately, many barriers to HIV testing still remain. Stigma and discrimination still deter people from taking an HIV test. Access to confidential HIV testing is still an issue of concern. Many people only get tested after becoming ill and symptomatic,” Dr Borang lamented. Being Arunachalee president Kuku Ringu and APSACS deputy director (IEC) Tashor Pali also spoke on the occasion. The Mega winner of MMC Rock Competition and Jomli Koyu from the Reloaded enthralled the audience with their music while sharing awareness about HIV at the same time. World AIDS Day is observed on December 1 each year. It’s an opportunity for people worldwide to unite in the fight against HIV, to show support for people living with HIV, and to commemorate those who have died from an AIDS-related illness.